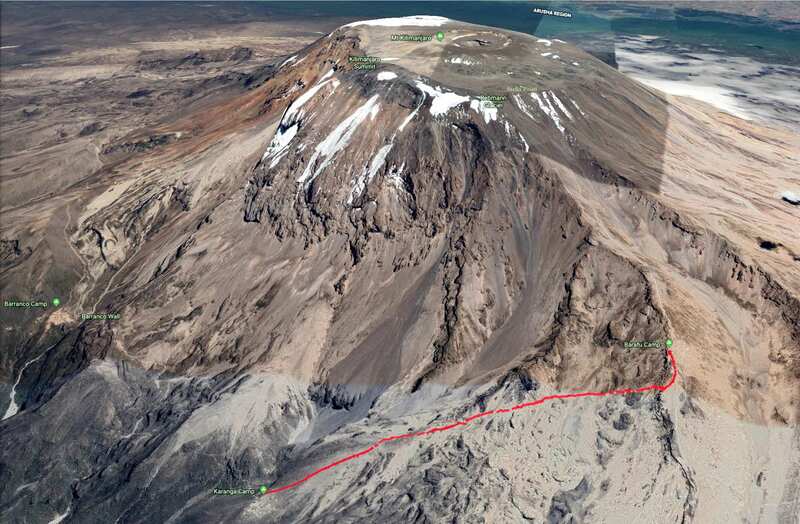 The red line on the satellite image below is the track we took on Day 6 of our Kili trek. 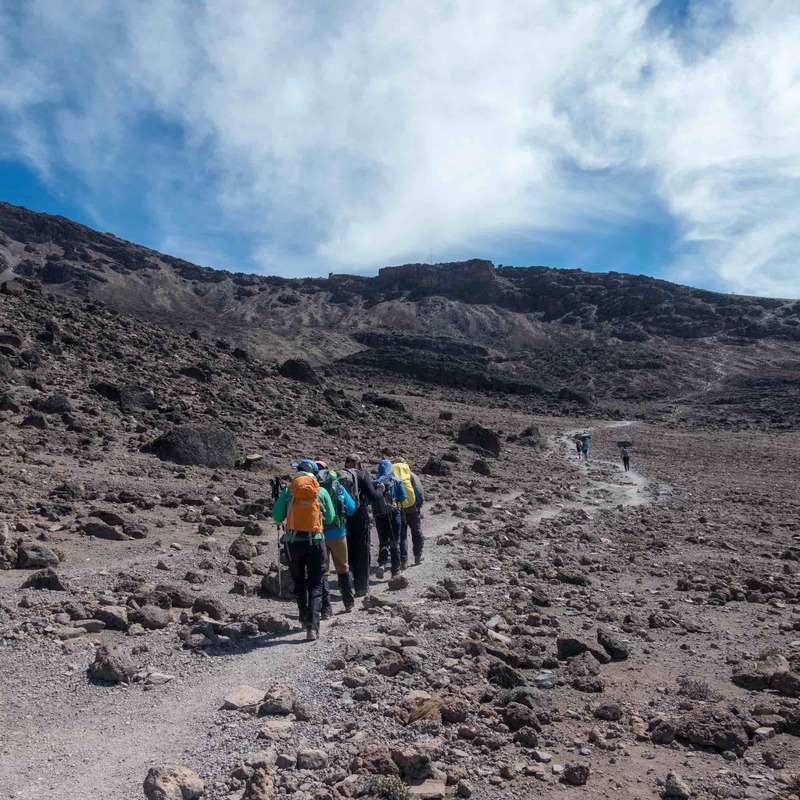 Over the three-kilometer distance that we walked, we would gain 600 meters in altitude by the time we walked up to our Popote campsite at Barafu Camp. time spent walking: 2 hr. 30 min. The stats above give an idea of how my body dealt with the day’s walk. Compared to the previous day, we covered 2.3 km less distance and spent 1:40 hr. less time doing it. However, the calorie burn was only 15% less – thanks to the almost continuous uphill we faced. The steepest sections would be at the start of the day and at the end as we approached our tent site. It was another beautiful morning in the neighbourhood as we gathered in the dining tent shortly after 7. The sun was out and there was little wind. We had clear views of Kilimanjaro’s summit and of Mount Meru, some eighty kilometers to the west. 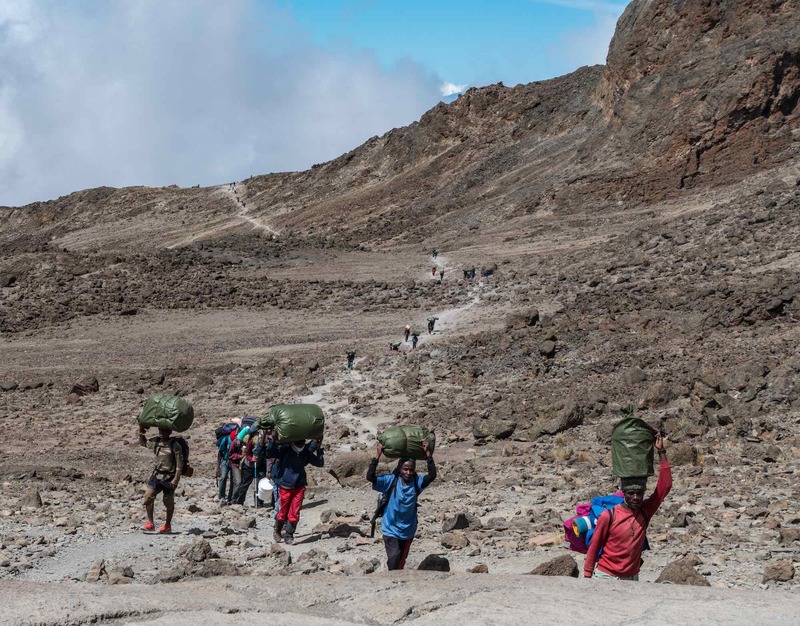 From the Karanga Camp, there is an initial uphill section to deal with. It is up and over the hill with a nice bit of downhill or flat as a reward – as shown in the photos below, the first of which shows our of our guides, Yusuph, watching as various members of the Popote team head downwards. Thirty minutes later that spot on the trail where Yusuph was standing was on the distant ridge on the top third of the image. 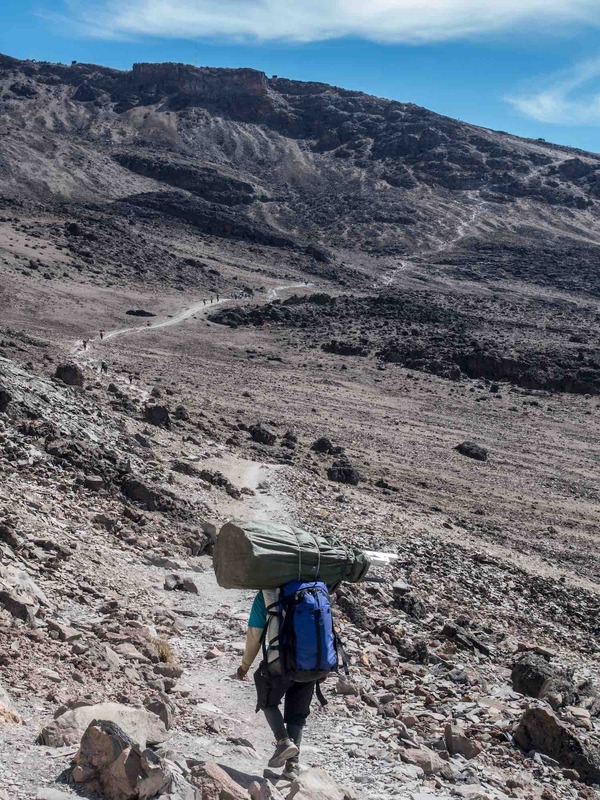 I sat there and watched the porters with their double carries – backpacks on their shoulders (but without the use of hip belts) and bags on their heads and wondered if having that weight on top of the heads was actually effective. This Wikipedia article (see here), while providing some interesting background, left me wondering! Turning around from the porters coming my way, I faced east and saw the Barafu Campsite on the top of the ridge up ahead. While it looked fairly close, it would take us about 90 minutes and another 400 meters of uphill to get there. Well, there is certainly no ice at Barafu. But there was wind – and it would only pick up as the afternoon turned into evening. 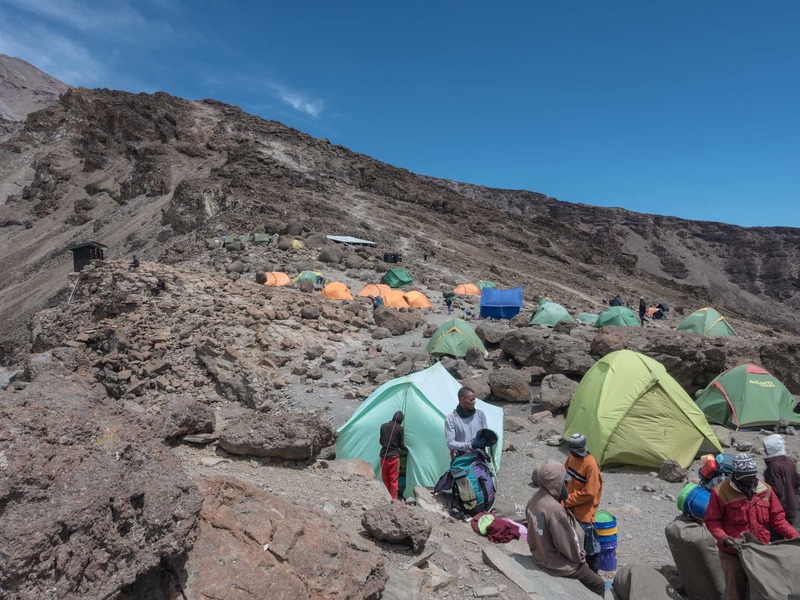 Given the number of trekking parties at Barafu, the campsite area goes up the ridge for some distance. 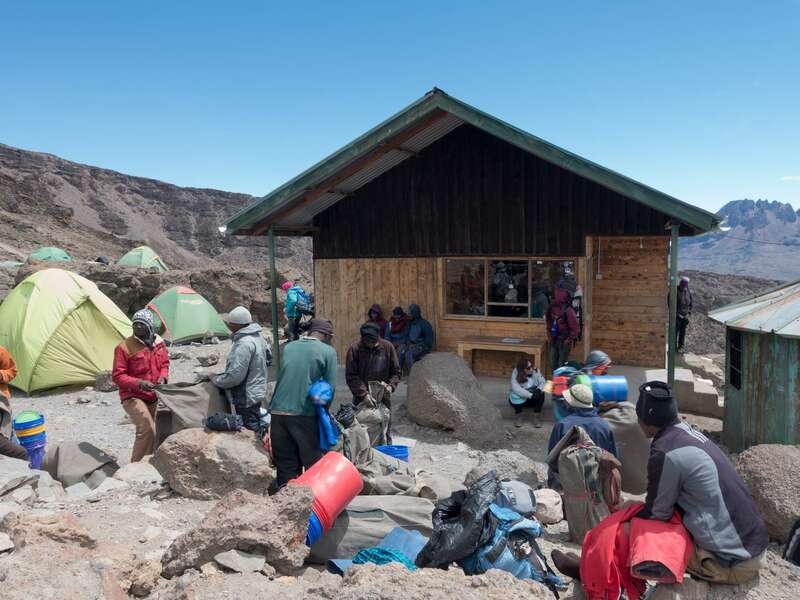 We walked through the lower Barafu tent sites and continued on towards the ranger’s hut. The Popote crew had set up our camp near the hut behind some rocks that provided a bit of a windscreen. 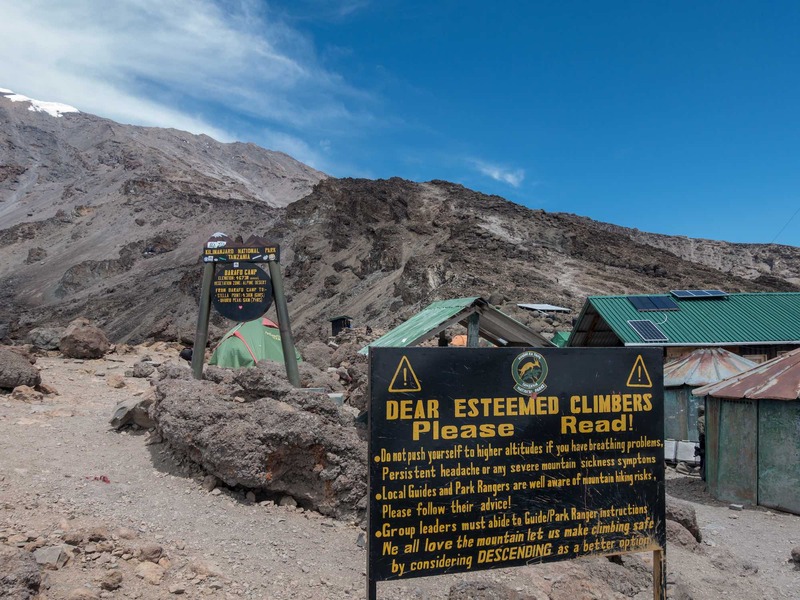 The mandatory ritual of the day – the sign-in at the ranger’s hut – done, we took in the scene – the fellow trekkers, the guides, the tents – and could feel a special buzz in the air. This was it, the spot we had spent six days curling around and up the slopes of Kilimanjaro to get to. Staring at the ranger’s trekker registration book, I scanned through the day’s list of signatures and the countries of origin associated with each. There was one more detail I looked for – the age of each trekker. I did a second scan when I did not find anyone older than the two 67-year-olds on our Popote trekking team! “No way!” I thought. It meant that for a very brief moment Mark, my fellow trekker from California, and I might be (FWIW!) the two oldest guys on the top of Kilimanjaro the next morning! 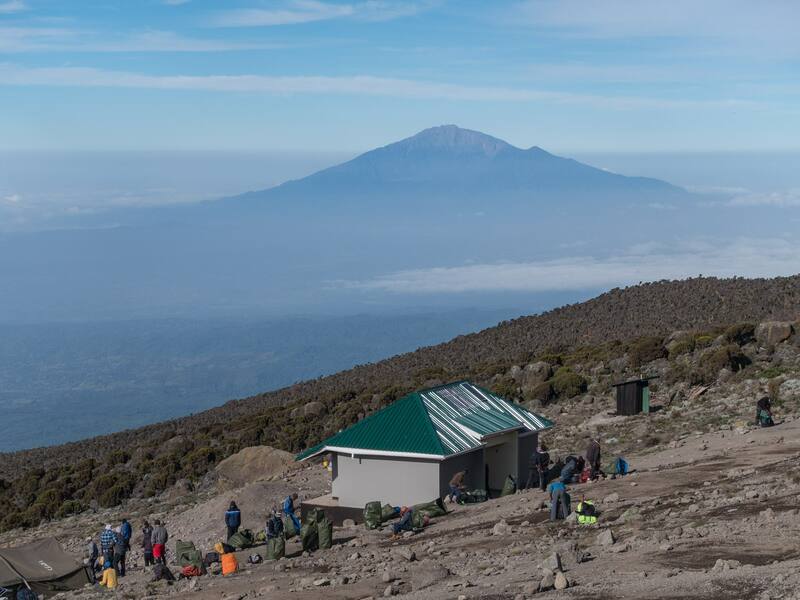 Behind the ranger’s hut and to the east sits Mawenzi, one of Kilimanjaro’s three volcanic cones. 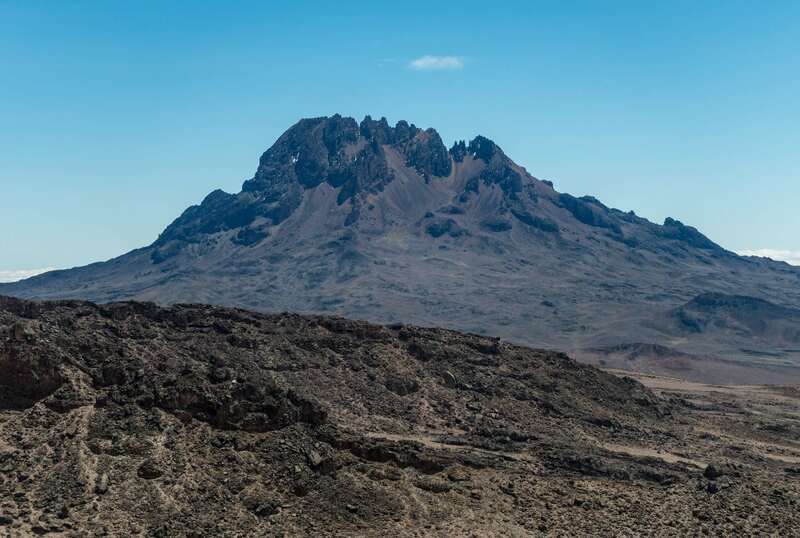 It is also the third highest peak in Africa at 5148 meters, only 51 meters lower than Batian Peak on Mount Kenya. 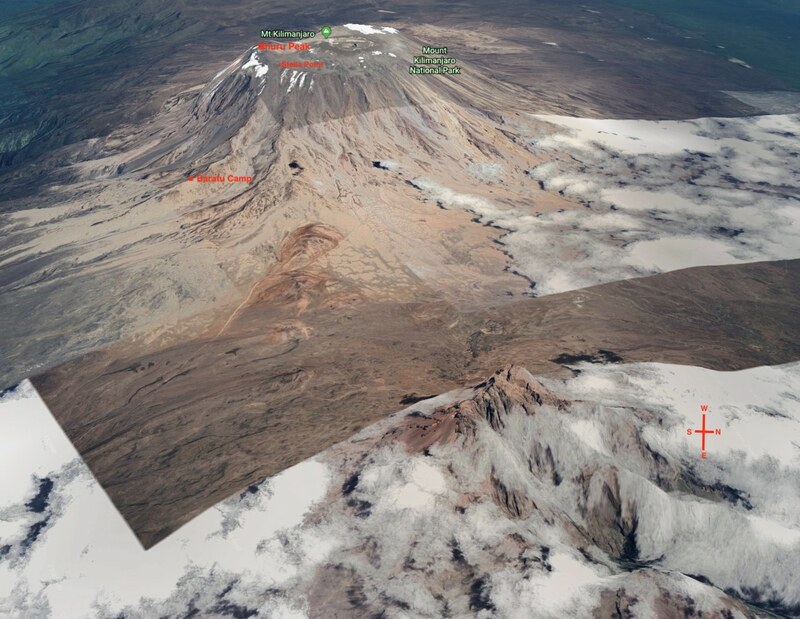 Unlike the walk to the top of Kibo, the climbs to the top of Mawenzi and Mt. 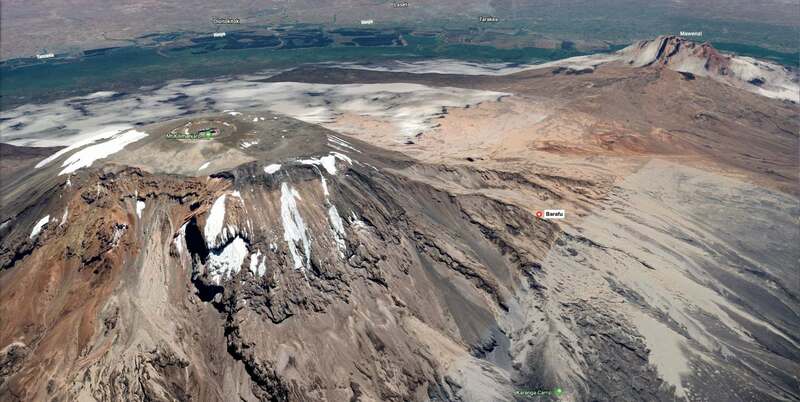 Kenya’s highest peak require some mountaineering skills. 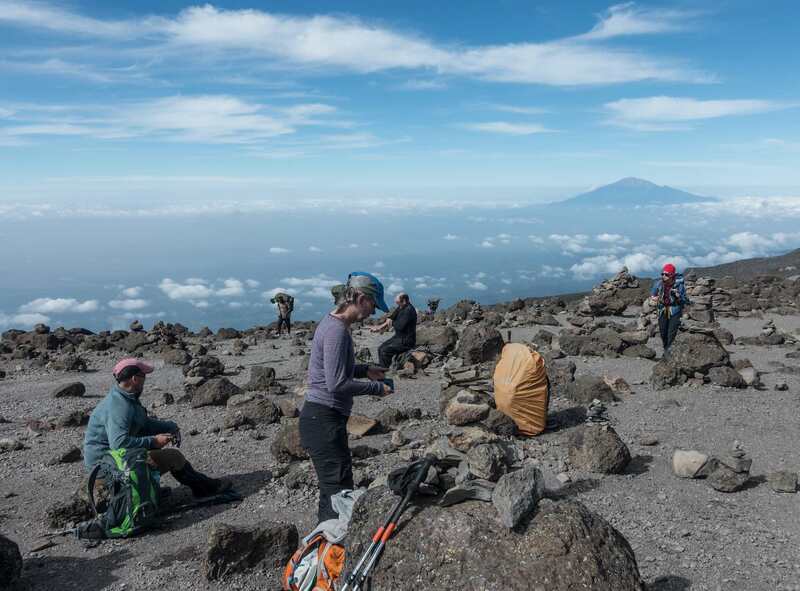 In speaking with our guides, it was clear that they had never taken on a climb of Mawenzi. Googling for more information on how to climb Mawenzi came up with very little except for this summitpost.org entry from 2004! 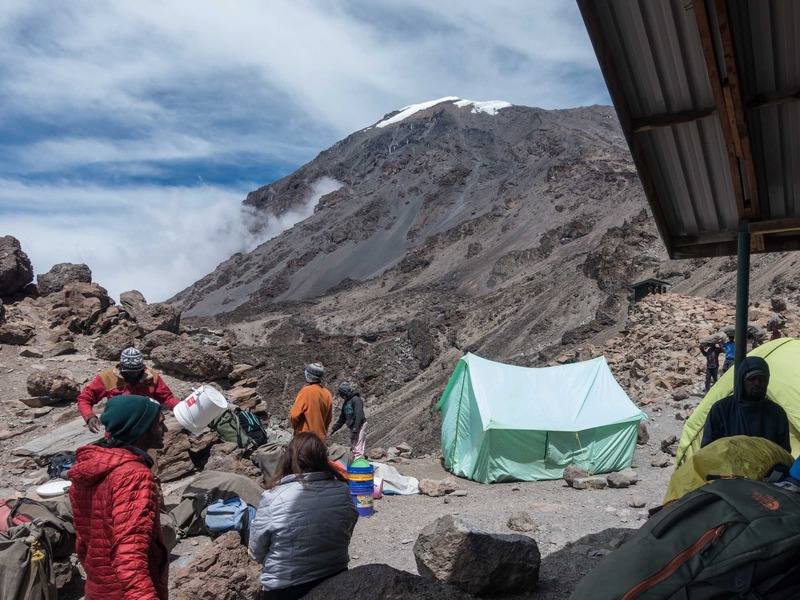 Mawenzi – an interesting diversion but we had our own summit to worry about! Well, not exactly worry but it still had to be done. This was not my first time at this altitude – the year before I had walked up and then over Saribung La in the Himalayas. 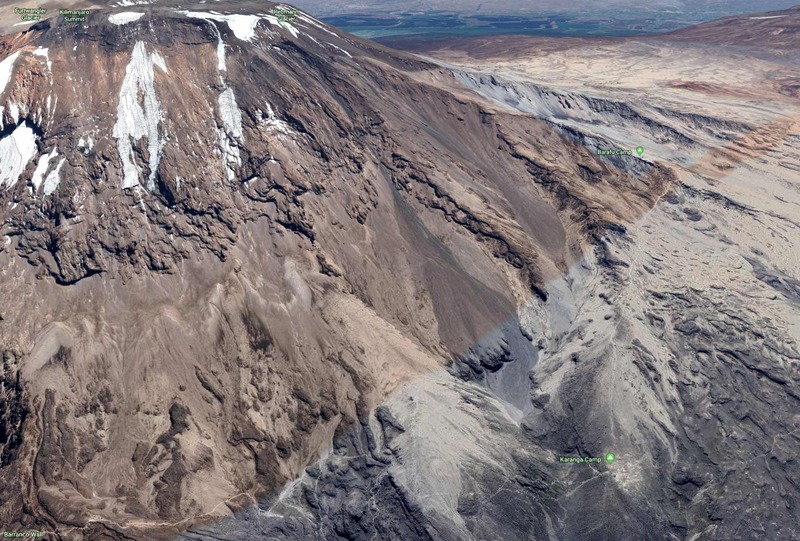 It was 160 meters higher than Uhuru Peak. My walk to the top of Chimborazo (6240) in Ecuador back in 2009 was the highest I will ever get to. That same trip I had also climbed Cotopaxi which is just a bit higher than Kibo. A Cordillera Blanca climb had also taken me to 6100. In six days of easy to moderate walking from Lemosho Glades (2389 m/7838′) to Barafu Camp (4662 m/15295′), we had gone up 2273 m/ 7457′ in altitude. All five of us were doing fine; no one had exhibited any signs of altitude sickness. Still, you never know how your body is going to react to the increasing altitude.we just had to relax – and try to sleep – until our 11:00p.m. wake-up and then start our walk in the dark. 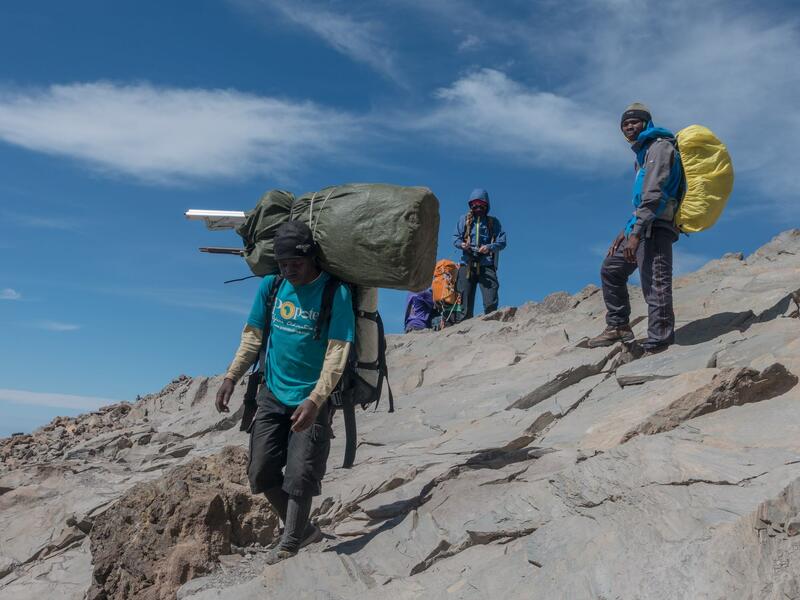 On our ascent, we would be accompanied by our three guides – Dixon, Yusuph, and Majura. 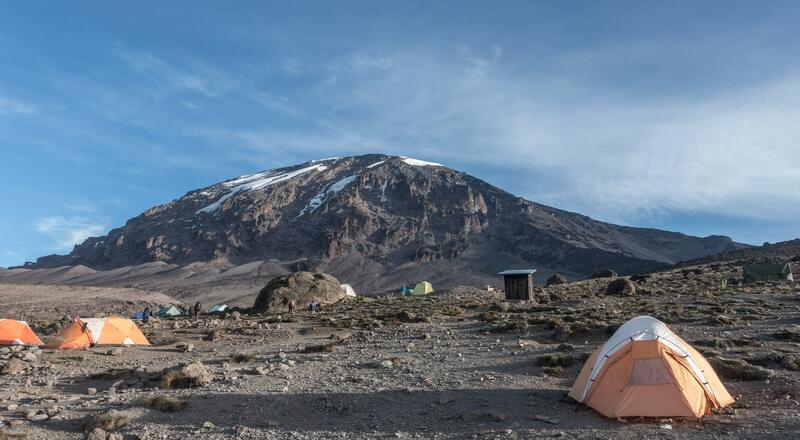 Also along for the climb were Fella and George, the two members of the Popote team who had taken care of us in the dining tent, bringing in the food from the cook tent, providing us with hot water – anything they could do to make things easy and comfortable for us. So – five trekkers and five support staff. The nightly blood oxygen saturation level and pulse rate readings had become a ritual we looked forward to! 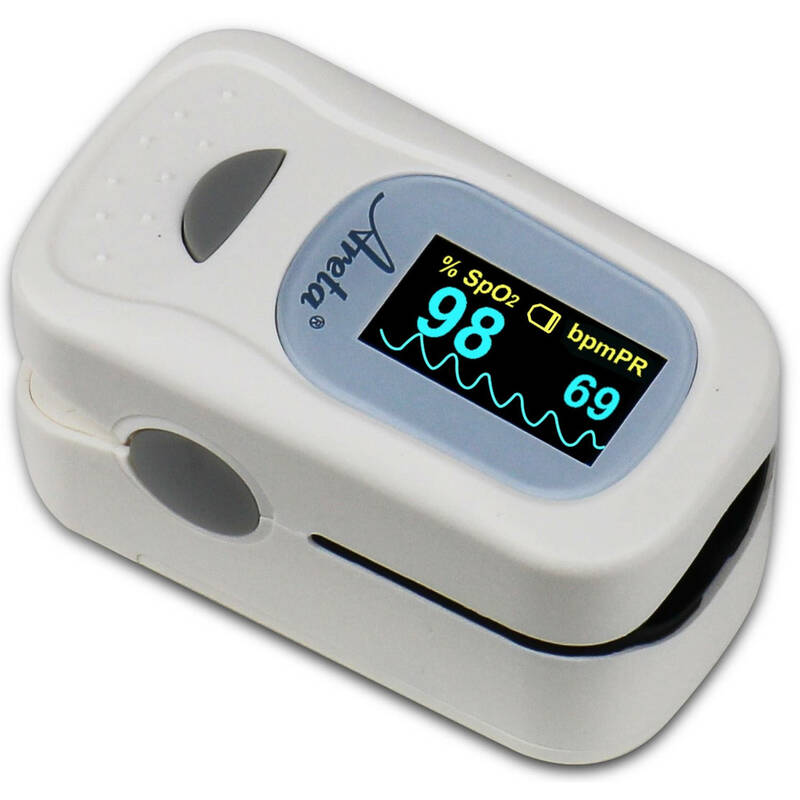 The finger pulse oximeter would go around the table and the results would be recorded. However, we did not do the oximeter readings at Barafu! Perhaps the thought was that the blood oxygen saturation level readings might be a bit lower than the 90+ that we had scored on the two previous evenings. Why give us another thing to worry about as we went off to our tents after supper and tried to get a bit of rest before our midnight wake-up call! Coming up – the single most difficult section of our Kilimanjaro adventure, the six to seven-hour walk up to Stella Point in the dark. 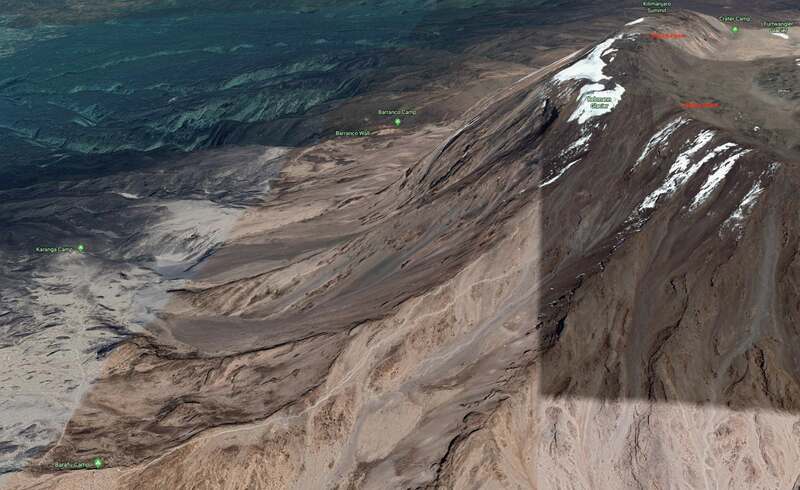 Barafu is at the bottom left of the satellite image below; Uhuru Peak is at the top right. Of course, we would not really see a thing as we would do it in all but total darkness except for the light of our headlamps! In six hours we would gain 50% of the altitude we had gained in the first six days of the trek! With sunset, the temperature dropped towards freezing and the wind had gotten worse…much worse. I may have slept an hour or two! This entry was posted in Africa, hiking/trekking. Bookmark the permalink.